It was my Gran's 84th birthday this weekend. Naturally, I was going to make her cake :) Coming from an Asian background, where so much of our culture is based around symbols and meanings for everything (especially what is auspicious or could ward off bad spirits) I wanted to incorporate much of these traditions into the cake whilst making it modern and beautiful. 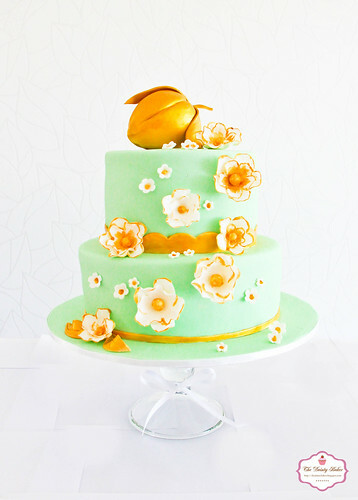 One main criteria of this cake was that somehow or some part of the cake would have to have a peach. For those of you who don't know, peaches are a symbol of longevity in our culture. The God of Longevity called "Sau" would often carry a peach in his hand. Traditionally, Chinese cakes called 'Longevity buns' or 寿桃, which is basically a sweet bun filled with lotus paste or red bean in the shape of a peach are made for the birthday boy/girl. I wanted to follow this tradition but not have the old fashioned look. 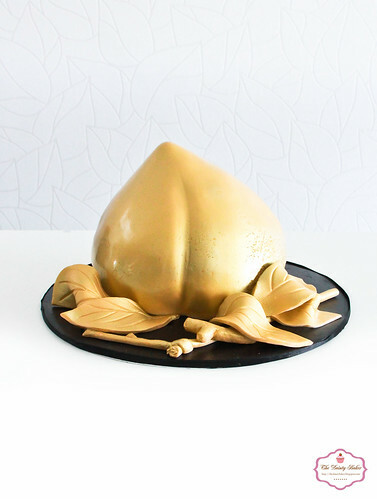 As I had already made a giant golden peach before I wanted to do something a bit different. 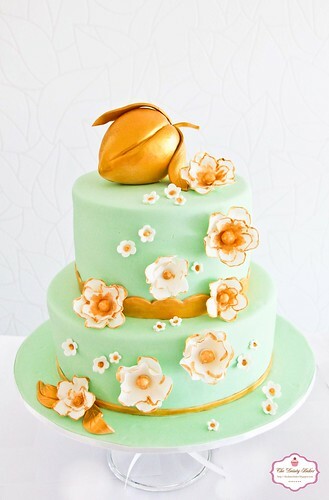 Initially, I wanted to incorporate lots of red and gold because these are the colours for prosperity and happiness etc etc I wanted a dragon wrapped around the cake with a golden peach on the top. I thought this might be a bit cliche so instead I opted for a more girly, pretty design. 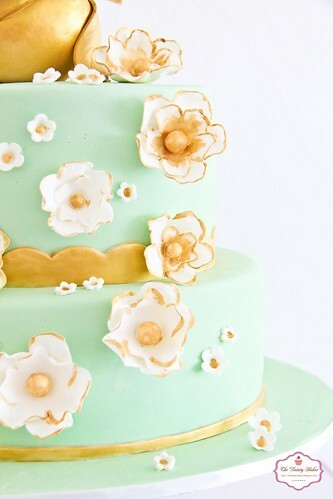 I love the colour combo of mint green with gold, so I used this as a basis and came up with this. 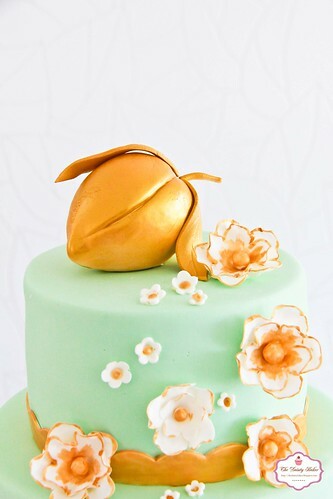 It was modern and pretty yet didn't steer away from the traditional meaning and wishes we wanted to give to our Gran. All the decorations including the flowers were hand made and hand painted. The flavour of the cake was Chocolate with fresh strawberries and a lovely chocolate ganache. 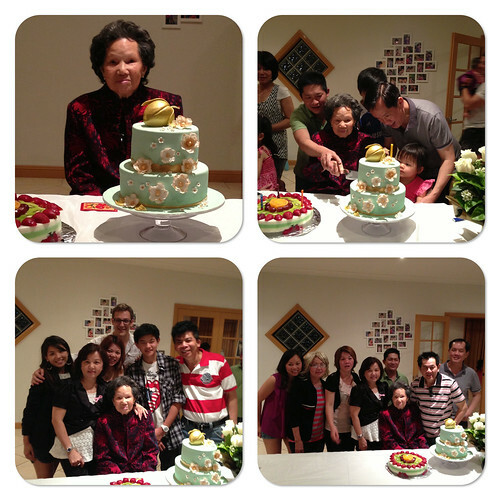 Happy Birthday Wor Ma!! Wishing you a happy, healthy and long life. Another amazing cake! I love the details! Happy birthday to your grandma! That is a truly awesome cake! It just looks so elegant and beautiful! Happy (belated) Birthday to your ah ma! Wishing her every bit of happiness and health!